From November 14th to 17th, Düsseldorf hosted a new edition of MEDICA, the World Medicine Forum in which approximately 5,000 exhibitors from more than 70 countries showcased their products and solutions in medicine. 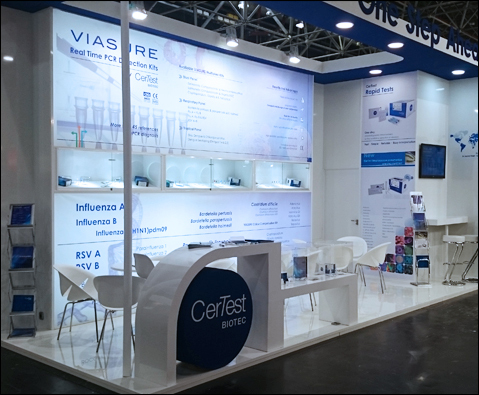 CerTest Biotec, a regular company in this event, showcased its latest innovations for the in vitro diagnosis of infectious diseases in human applications, through its two main families, VIASURE Real Time PCR Detection Kits and Rapid Test. VIASURE Real Time PCR Detection Kits is the diagnostic product line, based on molecular biology, that allow the identification of the pathogens causing infectious diseases from the present DNA in the sample. With more than 45 references available, the new MULTIPLEX kits allow the identification of several pathogens in a single assay, which can be sent and stored at room temperature thanks to the lyophilized format of the reagents included in each kit. The Rapid Test family will also increase its number of available products, with new developments designed to offer a sensitive and simple screening test for a presumptive diagnosis in infected persons. Renovated in design and capacity, during the four days of the fair, booth 3J20 was open to receive all the people interested in knowing the news that CerTest released this year.